Experience the ultimate feeling of escape, and enjoy travel at its most liberating with Neyzen’s luxury private and cabin gulet yacht charters in Turkey and Greece. We work closely with you to custom design routes and itineraries for your ideal yacht charter along the spectacular Turkish Riviera and Greek Dodecanese Islands. A fantastic way to explore these beautiful coastlines and islands, chartering a yacht allows a perspective very different to overland trips, not to mention a special sense of freedom and privacy while on board. Sea rhythms and the open air enhance your unique experience of Turkey and Greece, their diverse landscapes, warm hospitality, cosmopolitan cities, fantastic climate and rich history. Experiencing these cultures while staying close to nature, offers the perfect balance of adventure, reflection and relaxation. Whether you’re looking to lose yourself in nature, explore the ancient sites, enjoy sailing and water sports, or relax in the sun, there are endless route combinations that will give you exactly what you want from your yacht charter holiday. 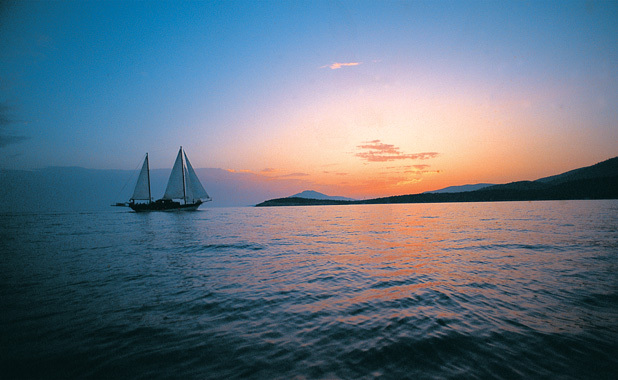 Starting and ending in Bodrum this tour touches on some of the most enchanting secret spots in the Bodrum region and in between explores a selection of the beautiful and fascinating Greek Islands of the North Dodecanese archipelago. Relax into the idyllic rhythm of gulet yacht cruising, site-seeing as you like, enjoying fabulous swimming, relaxing on deck, and feasting like kings and queens both on and off board. Meet in the vibrant, historic and cosmopolitian resort town of Bodrum sail to the lovely Gumusluk, a sleepy coastal village featuring pretty beaches, a slightly bohemian atmosphere, incredible fish restaurants and home to the ancient Carian ruins of Myndos, some of which can be explored underwater. 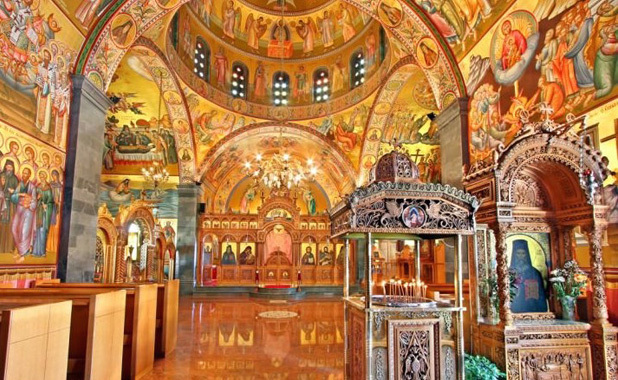 From the larger marina town of Turgutreis nearby cross into Greek waters to the island of Patmos, an important site of pilgrimage since ancient times and home of the fascinating Monastery of St John, many crystal clear bays for anchorage and fantastic restaurants. The next stop is off-the-beaten-track at Lispi Island, which features lovely virgin beaches, walks, a few rustic tavernas and a folky feel. From here, cruise to Leros, great for shopping and chic restaurants, and a hot spot for mega yachts, while still characterful and laid-back with lovely neoclassical buildings decorating the harbors. The next port of call is Kalymnos famous for truly pristine swimming waters, as an international rock-climbing destination, and historically as the island of the sponge divers. The connecting islet of Telendos is tiny and tranquil with its laid-back village atmosphere. Before ending the cruise in Bodrum, return into Turkish waters and discover the byzantine ruins and heavenly turquoise waters in the bay of Kisebuku. 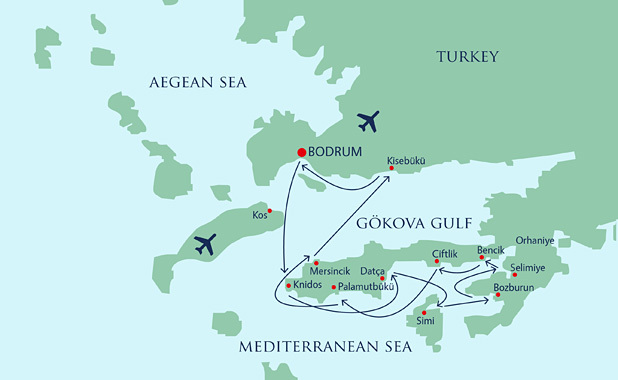 Departing in Bodrum and ending in Gocek. Tracing the routes of fishermen this classic Blue voyage itinerary reveals the real magic and astounding natural beauty of the south west coast of Turkey. This route takes in the dramatic pine forest covered landscapes of the Datca Peninsula, its coves, beaches and laid-back villages. After visiting the Greek Island of Simi, explore the mythical beauty of the Gulf of Hisaronu at Selimiye, Bozburun and Orhaniye. Discover Knidos and Dalyan for fascinating historical explorations of Turkey’s rich heritage. Most days you will anchor by sunsest in peaceful untouched bays where you stay for the night in the luxury and privacy of your yacht, waking each morning to the sounds of the sea and crystal clear waters for swimming, snorkeling and relaxing on deck. The sample routes outlined here are great inspiration for creating a well-designed itinerary to suit the interests of your group. Our in-depth knowledge of Turkey and the Aegean Greek Islands enables us to craft imaginative yacht sailing vacations taking you wherever you want to go. For advice on creating a tailor made itinerary contact us here. 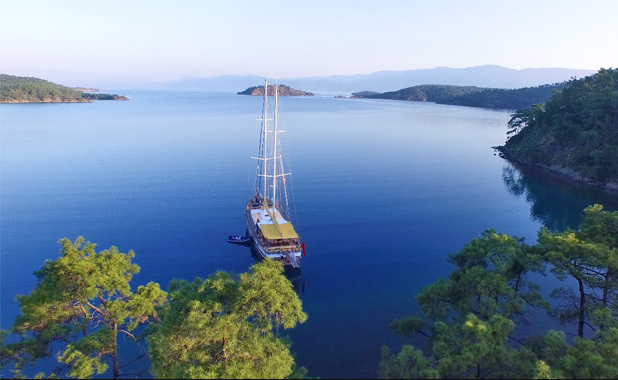 Neyzen also designs itineraries combining yacht charter with our exciting land travel tours, offering the very best of Turkey by both land and sea.